Nawagarh in Durg district of Chhattisgarh is a small place by all standards. As in all small places here too everyone knows everybody and it was not difficult to find a local journalist as soon as we reached Nawagarh. We were looking for help to investigate the story of a farmer’s suicide in Chhattisgarh. A simple enquiry at a local paan shop on the roadside got us the address and directions to the most famous journalist in town. Here journalists wear many hats. Ashish Jain runs a grocery shop apart from being a correspondent for a daily from Chhattisgarh’s capital Raipur. A big picture of him with a state Congress leader in his drawing room tells us that he is also active in local politics apart from journalism and his shop. While waiting for tea I asked him if there have been many incidents of farmers’ suicide in Nawagarh lately? 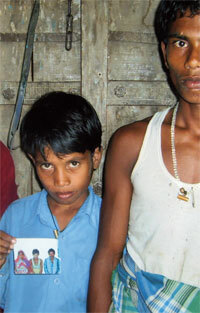 “No, we have never heard of any farmer’s suicide here,” Ashish said very confidently. He was, in fact, quite surprised to hear my question. His brother, who is a correspondent for another daily from Raipur and was in the shop next door while we chatted in the drawing room, overheard our conversation and made a quick call to the police inspector of the town and confirmed that no farmers had committed suicide in the area. I took out a list provided by the police headquarters in Raipur and started counting. It had names and addre sses of 23 farmers who had committed suicide in the last 18 months under Nawagarh police station. So how far were the villages listed here? I wanted to know. Ashish had a close look at the list and said that all the villages in the list were within 4-5 km from Nawagarh. But he still would not believe us and was shocked to hear that according to data of the National Crime Records Bureau, Chhattisgarh has highest rate of farmers’ suicide per one lakh population in the country.